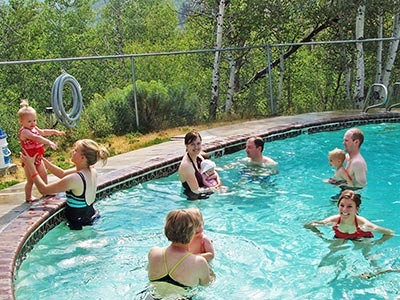 The Red Creek Lodge/Camping Swimming Pool is generally used by guests staying in the Red Creek Lodge at Reid Ranch or those staying in the regular Camping Area. Swimming times are now scheduled for each group, and time slots may include sharing with other groups. Guests should only use the pool assigned to them which is usually the one for the lodge or area they are staying in (no pool hopping allowed). Please check your rotation schedule to see which pool times have been assigned.